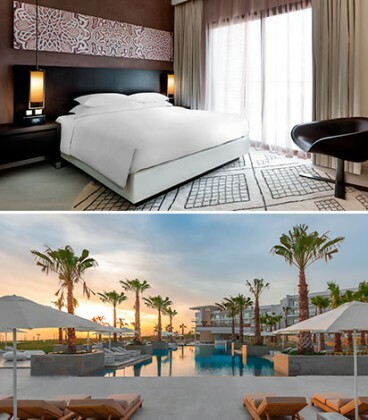 Located in Taghazout, a short drive from Agadir, the Hyatt Place is the latest jewel in the eponymous group’s crown and the first on African soil. Situated in the Atlas foothills, dominating the Atlantic coast, the hotel offers an array of activities from surfing to tennis and even hang-gliding, hiking, mountain biking and, above all, golf: a superb 18-hole course designed by architect Kyle Philips next to the hotel. 152 vast, contemporary and chic bedrooms and suites each boast their own balcony with a delightful view over the Atlantic coastline. We love the immense swimming pool in the gardens, the fitness centre and lastly the spa. It is decked out in the colours of labels Nectarome and Cinq Mondes. Two restaurants, including our favourite the Gallery Café, completes what this place has to offer, a haven for sport fanatics.